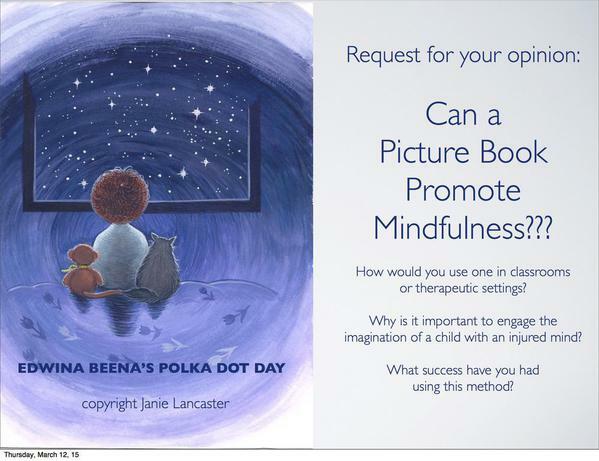 Have you used a picture book to promote mindfulness? What was your observations? I wrote a picture book "Edwina Beena's Polka Dot Day" to help children like me (traumatic childhood) to have a more peaceful mind. My original goal was to get my book distributed to kids in hospitals but it seems like the classroom is where it will end up. I did a pilot program with five second grade classrooms. The results were amazing! I have put together a teacher's packet with curriculum ideas, handouts and instructions for activities. If any teachers are interested in finding out more or trying it out please contact me. I will be doing this project with preschoolers next.